Walking into any market or drug store this time of year I am always a little bit surprised at the amount of silly and over priced Valentine things there are. Being a hopeful romantic, I always leaned away from the forced sense of the day. It is however a great time to take a moment and acknowledge the loves in your life and as always create some fun and tasty treats for your beloved. It is also a great time to spend in the kitchen with your kids and teach them the power of unconditional love. Truffles are so wonderfully rich, creamy and decadent! The flavors just roll over your tongue. Our best-kept secret is that they are so easy to make. They do need time to set so make sure that you plan it out. You can flavor them with all different kinds of chocolate, cognac, Grand Marnier, amaretto, sambucca, orange zest, nuts, espresso or what ever you like. I have been making them for many years and people always flip. You can start with a basic chocolate and make an assortment for your par amour. You can totally use your imagination to come up with romantic packaging. This is the first truffle that I ever made as a teen-ager. I couldn’t believe that something so simple could be so good. Growing up in the bay area, I always used Ghirardelli chocolate because it wasn’t until I was in college that I discovered all those amazing European Chocolates. This is really simple and fun to do with the kids. In a double broiler, melt the chocolate over simmering water, stirring constantly. (If you don’t have a double broiler you can use a smaller pan for the chocolate and a larger one to simmer the water. Just be careful especially with the kids, as it is slightly awkward.) Remove from heat. Add butter stirring until melted. Chill until firm enough to form into small round pieces. Roll in ground chocolate. Chill overnight in refrigerator. Makes about 40. This is slightly more labor intensive, but not much, really. I’ve given some rolling suggestions as well as making half with vanilla and half with Grand Marnier. They all look really pretty together and give a nice, flavorful assortment. Bring cream to boil in heavy medium saucepan. Remove from heat. Add chocolate; whisk until melted and smooth Add corn syrup. Divide in half. Whisk the vanilla to half and the Grand Marnier to the other. Pour into two medium bowls. Cover; chill until firm, overnight. Place cocoa, coconut and nuts in separate bowls. Roll truffles between hands into rounds. 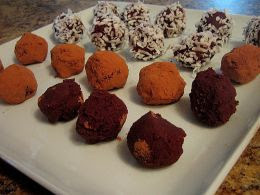 Roll 1/3 of truffles in cocoa, 1/3 in coconut and 1/3 in nuts. Cover with plastic; chill until ready to serve. Around mid-day I usually have a cup of green tea. It was one time when I was eating a piece of chocolate that I thought how amazing the two would be together. The subtle essence and healing power of green tea make these really special. In a medium saucepan bring cream and butter to a boil and stir in tea leaves. Remove from heat and let steep 5 minutes. Meanwhile, finely grind chocolate in a food processor and transfer to a bowl. Pour cream through a fine-mesh sieve onto chocolate, pressing on and discarding tealeaves, then whisk until smooth. Chill mixture covered, until firm, overnight. Drop mixture by rounded teaspoons onto prepared baking sheet. . Refrigerate until firm, about three hours. Place cocoa powder in a bowl. Roll truffles in mixture. Cover with plastic; chill until ready to serve. A favorite combo of mine! Bring cream to boil in heavy medium saucepan. Remove from heat. Add chocolate; whisk until melted and smooth Add corn syrup. Pour into a bowl. Cover; chill until firm, overnight. Place powder sugar and ginger in a bowl. Roll truffles in mixture. Cover with plastic; chill until ready to serve. In a medium bowl of an electric mixer beat the butter and sugar until light and fluffy. Add the vanilla. Mix the flour and salt by hand to the butter mixture until well mixed. Divide the mixture in half and wrap in plastic and chill for one hour. Roll each half on a floured board to 1/8-inch thickness. Using a 2 to 3 inch heart cookie cutter cut out cookies. Place on ungraesed cookie sheet and bake in a preheated 350 oven for about 12 minutes until pale golden. Cool on cookie rack. * ******You can melt 1 bar of German baking chocolate in a double broiler and dip half of a heart in chocolate. It depends on your platter. If you are doing truffles this might be too much chocolate…well, I don’t know…is there such a thing a s too much chocolate? After all it is one of the most infamous aphrodisiacs!!!! This is a great kid or “grown up” project. One year I made very naughty fortunes and included them on a dessert platter with the above truffles and had a very happy Valentines Day. The next day not wanting all the sweets around for me to eat I offered some to my gardeners. When I realized what I had done I grabbed back all the fortune cookies, but my friends still tease me about how great my yard looked for weeks after! So make them with cute kid messages for their favorite teacher and friends or make seductive quotes for that romantic one in your life, but make sure they don’t get mixed up and be sure to be careful of who gets the leftovers!!!! Cut 20 1/2 inch by 3-inch papers and write messages with non-toxic ink. Because you have to work fast do only one per sheet, per oven rack at a time. Preheat oven to 400 and spray baking sheets liberally with bakers joy. In a medium bowl beat egg whites and sugar until just foamy. Add whipping cream, butter and almond extract and beat for 1 minute longer. Add flour and salt and beat until smooth. Pour 2 tablespoons batter on prepared baking sheet and with the back of a spoon spread evenly into a 3-inch diameter. Bake cookie in the middle of the oven until golden around the edge, but pale in center about 8 minutes. Working quickly, remove the cookie with a spatula and place onto a flat surface. Put a prepared fortune in the middle of the cookie and fold cookie in half. Bend pointed ends of cookie toward each other and hook them onto the rim of a bowl to cool completely. Makes about 20 cookies. Last, but not least…. you can make a platter of cookies and truffles to end your romantic meal or give to loved ones. If you want to create a really special and intimate ending try feeding each other this chocolate fondue. You can use pound cake, walnut bread and any of your favorite fruits and berries. It is so simple and elegant and can be so much fun!!!! 2 teaspoons vanilla, or a splash of brandy or orange liqueur.